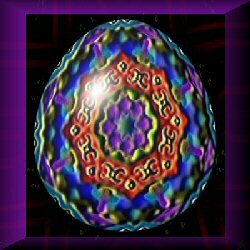 The Flatland Digital Artwork Clip Art Gallery: Faberge-Style Egg. EASTER EGG CLIPART. A purple flower with a gold border surrounded by a red enameled flower with other gemlike effects in purple, blue, and forest green. The frame is purple.